AP TET Computer Based Online Exam dates- Schedule for Paper-1 and paper-2 Released /Andhra Pradesh Teachers Eligibility Test 2017 Notification Conducting Guidelines -Online Application Form @aptet.cgg.gov.in AP TET 2018 Andhra Pradesh TET 2018 is denoted by the name of Andhra Pradesh Teacher’s Eligibility Test which is usually organized by Higher Education Board of Andhra Pradesh (BSEAP). This examination mainly focuse on the candidates who eagerly aim to become a Teacher. Interested candidates can check their eligibility criteria in order to appear for the examination. Selection will totally based on the score which candidate secure in Andhra Pradesh TET 2018. As per NCERT guidelines every indivisual that who wants to become a teacher all over India has get Eligibility or has to appear Eligibility Test and get qualified to work as a teacher in any school all over the India. Applying same rule in AP and Telangana conducting teachers Eligibility Test TET for AP and Telangana Separately. Central TET also conducted by CBSE to get eligibility to work in Kendriy Vidyalayas Navodayas and other central Schools. In the Same way Andhra Pradesh is going to Conduct AP TET for the first Time after separation from Telangana Hyderabad. Aspirants are eagerly waiting for the Notification. The Andhra Pradesh Teacher Eligibility Test (TET) was postponed. 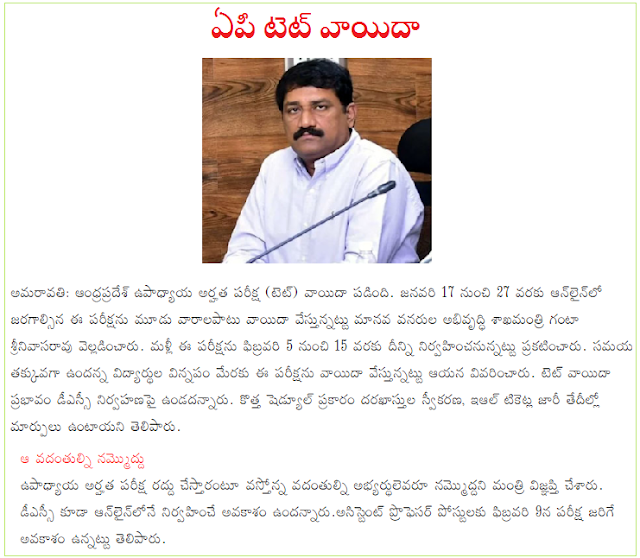 Human Resources Development Minister Bhagha Srinivasa Rao said the test was to be held online from January 17 to 27. The test will be held from February 5 to 15. He said the test was postponed to the student's request for less time. TET deferred effect on DSC management According to the new schedule, the adoption of applications and changes in the date of issuance of e-ticket. Applicants can download the hall ticket from the official site of APBSE. Admit card is the mandatory document required in the examination, it contains all the details related to the candidate and examination. It contains name, father’s name, mother’s name, DOB, date& timings of the examination, venue of the examination & instructions to be followed in the examination. Don’t forget to bring the admit card on the date of the examination otherwise the examiner will not permit the candidate to appear for the examination. Search for the link of Andhra Pradesh TET 2018 Admit card and click on the link. Enter your registration no., DOB, security pin. Take the print out of the Admit Card can keep it safely. There are basically two papers: Paper-I is at the Primary teacher level (I-V) and Paper-II is at the Upper Primary Level (VI-VIII). Only Objective type of questions will be asked. It contains of 150 questions of 150 marks. Duration of the question paper would be of 2 ½ hrs. Application form of Andhra Pradesh TET 2018 will be available from the Dec month 2017 . Applicants were advised to fill their application from prior due dates. Interested candidates who were eligible/ qualified can apply for Andhra Pradesh TET 2018 Application form and submit it on the official portal. As this Teachers Eligibility Test is organized by the educational board of Andhra Pradesh mainly for the recruitment of candidates who aims at becoming a teacher in the state of Andhra Pradesh. Application fee amounts to Rs-250/- for all the category candidates. Mode of payment would be via online mode. Search for the link ‘Andhra Pradesh TET 2018 Application Form’ and open it. Upload the scanned images and documents in the specified format. Review your form and make application fee payment. After remitting fee, click on the submit option. After successful completion, don’t forget to take the print out of the application form.